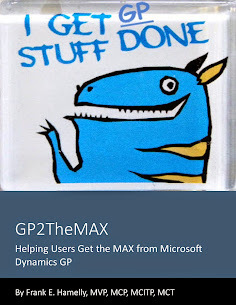 GP2TheMAX - Helping users get the 'MAX' from Dynamics GP: Welcome to GP2theMax! Well, since everyone else is doing it, I decided I might as well have some fun blogging too! Seriously, though, I'm hoping this blog will provide useful information about how to get the maximum return on your GP investment. This blog will focus mostly on day-to-day transaction processing and how to do it more quickly and effectively. We'll post lots of tips and tricks and some of the lesser-known features in GP that can really boost productivity with a minimum of new learning involved. So, here we go. Please make suggestions as to how to improve this blog. This is OUR space. Let's get the Max out of it! Great to see you have started your blog. Now I wont have to hunt your posts in the groups to look for the 'information gems' you provide. Glad to see you finally blogging. I'm looking forward to reading your posts!